Each of the three potential Delridge Link station sites has substantial tradeoffs, including varying amounts of resident displacement and housing demolition. Like the Chinatown/International District (CID) station, the Delridge station is controversial. Each station has drawn the attention of Seattle elected officials, who will dig into both stations at a special meeting on March 29. Unlike the CID station, Sound Transit seems agnostic about its preferences for the station. Each has its own technical and political problems. Beyond housing, another crucial concern is bus integration. Delridge Way SW carries Metro’s Route 120, one of the highest-ridership routes in the regional bus network. It will soon be replaced by the RapidRide H line. That upgrade could follow the welcome precedent of other RapidRide lines and boost ridership over previous bus service. When Link comes online, Metro could (and probably should) choose to restructure the H to terminate in Delridge, and usher Downtown-bound riders onto Link. All that means the Delridge station is a vital bus-to-Link transfer site. It’s where riders from points as far south as South Park and White Center will access the Link system. For clarity’s sake, each heading also names alignment package of which each station is a component. Read a slide deck Sound Transit presented to Delridge residents here. This station would offer the least TOD potential and poorest rider experience, but it will require the least demolition and displacement. The station would straddle Delridge Way close to its north terminus, at the bottom of an on-ramp to the West Seattle Bridge. The site is at the very edge of the neighborhood, and a long walk for most residents. The on-ramp for the Bridge will remain a high-volume car traffic choke point even after Link is built. The bottom of the ramp is a scary place to cross the street, and options are limited for a bus transfer depot. Buses would probably get caught in queues that can extend several blocks south of the onramp during peak hours. The Bridge and Port of Seattle facilities north of the station site, the Nucor Steel mill is nearby on the west, and a steep slope is directly to the east, all of which limit its TOD potential. 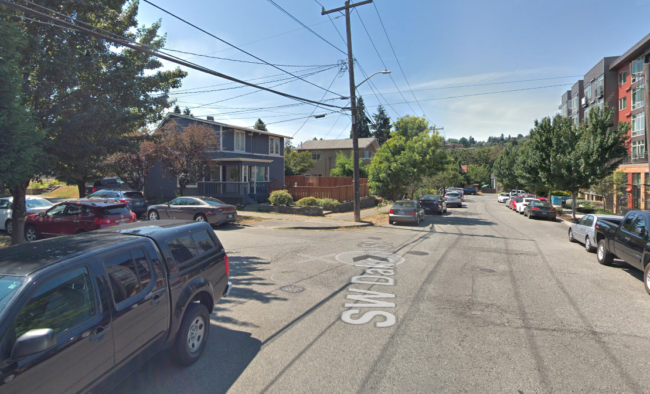 This alignment would require the right of way to cross the block between 25th Avenue SW, SW Genesee Street, and Delridge Way, demanding some housing demolition. The block in question is presently built with single family homes and townhomes. This site, which would also span Delridge Way with its south end at the intersection with SW Dakota Street, is more central to the neighborhood than the “North of Andover” site. The site offers decent pedestrian and bike integration, since it’s only about a block away from a greenway. The slide deck also raises the possibility of a hill climb up Pigeon Ridge aligned with SW Dakota. Bus integration is the best of the three station options. Buses could conceivably stop under the station itself, and riders could easily and safely make their way up to the platform from either side of the street. It should also be far enough south of the Bridge onramp for buses to avoid the queues that regularly form during peak hours. Uniquely among the three sites, the station is next to offices and corporate campuses on the west side of the street. An Indian Child Welfare Office is immediately to the west of the site. Local chains Metropolitan Market and Bartell Drugs own, respectively, an operations center and headquarters on the north end of block. The east side of the street features a few single family homes. A block with strip malls is just north of the Bartell’s office. If Metropolitan Market, Bartell’s, and the Indian Child Welfare Office are willing to relocate, and the strip malls can be repurposed, high density residential or mixed use development is possible and it wouldn’t come at the cost of displacing existing residents. But those are a lot of ifs. And, unfortunately, like the “North of Andover” site, Pigeon Ridge limits construction to the streetfront on the east side. 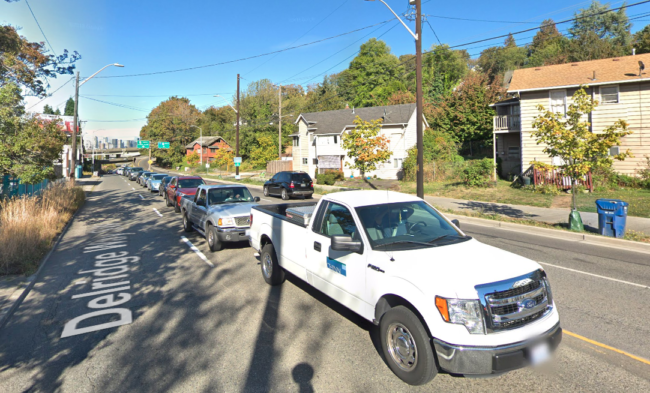 This alignment would also require the right of way to cross the block between 25th Avenue SW, SW Genesee Street, and Delridge Way, and the same housing demolition. Bus connections would be slightly awkward, but definitely better than the North of Andover site. Sound Transit’s map appears to suggest that northbound buses would take a left off Delridge and offload buses on SW Dakota Street. Otherwise, bus riders would have to walk a half block to the stairs and elevators of the new station, a distance roughly equivalent to the walk between the Mount Baker Station’s platform and bus depot. Unless northbound buses make that left turn onto SW Dakota, their passengers would have to cross busy Delridge Way. This station has brought out the most ire from Delridge residents. This station would require the most demolition of existing housing. It would be built over parts of two blocks, rather than in the middle of a street, which would permanently prevent further construction on existing residential-zoned land. The right-of-way would also require demolition of housing northeast and southwest of the site. The site also very close to Delridge Playfield, which would be difficult to repurpose because of FTA open space mandates. Why even propose such a fraught site? The portal for the top of the hill tunnel—which would require demolishing more housing—would need to be just southwest of the station site. That roughly ground-level tunnel portal would be several hundred feet lower than the high bridge needed to cross the Duwamish just a quarter of a mile away. The station site is the only place on the guideway that wouldn’t need to be at grade. There is some creative destruction possible with the site. The blocks in question are currently zoned single family, and hold standalone houses and townhomes. Since most of the blocks would be demolished for the station, right of way, and (presumably) construction staging, denser construction would be possible after the dust clears. The deck also raises the possibility of moving the path of a nearby greenway directly under the station, which would make for excellent bike integration. The Delridge station is a must-build, especially because of the bus connections. Unfortunately, the same geography that makes the area such an important waypoint also makes all the sites unlikable in their own special ways. When looking at access, the vertical elevation can be as important as the horizontal difference. It adds time for any transferring rider or pedestrian using stairs or an escalator. At what height from the street will the platforms be for these alternatives? Looking at the visualizations on the web site, it’s not clear where the station entrances will be. 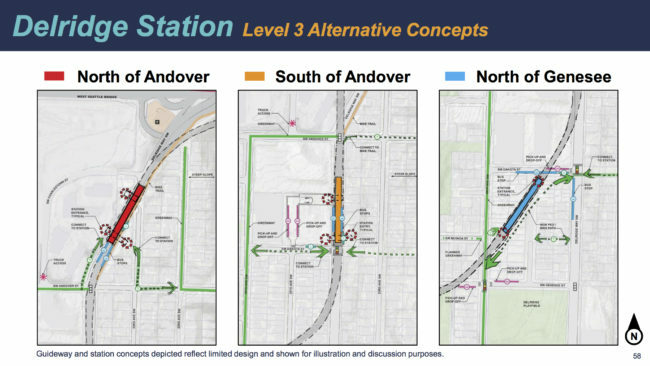 It is clear that the alternatives on top of Delridge will need a mezzanine because of the interest in having a center platform; the height is projected at 57 feet for north and south of Andover and 30 feet for north of Genesee. That’s not to say that higher is bad in this situation if ST could integrate the mezzanine with walkways on both sides of the street including the slope on the east side. I want to say that the first two options were higher elevation (50+? ft) while the last was obviously lower to be able to enter the tunnel shortly thereafter. I’ve not seen that number published anywhere, but ST staff discussed it with us during the last neighborhood meeting. One saving grace about elevated stations here is that they can provide at-grade walk/bike connections to Pigeon Point across Delridge. Great point. I think people tend to overlook this consideration when thinking about Ballard. If the drawbridge option has the possibility of a mezzanine-less elevated platform with good bus connections, then you have to wonder if that would be preferable to having the station a mile deep with elevators that will be slow, and escalators that won’t work. Metro’s long range plan has Rapid Ride H going downtown even after Link. And I think that’s the right call. IMO long-term you still need one route to provide local service to 1st Ave S between Spokane St and Pioneer Square. 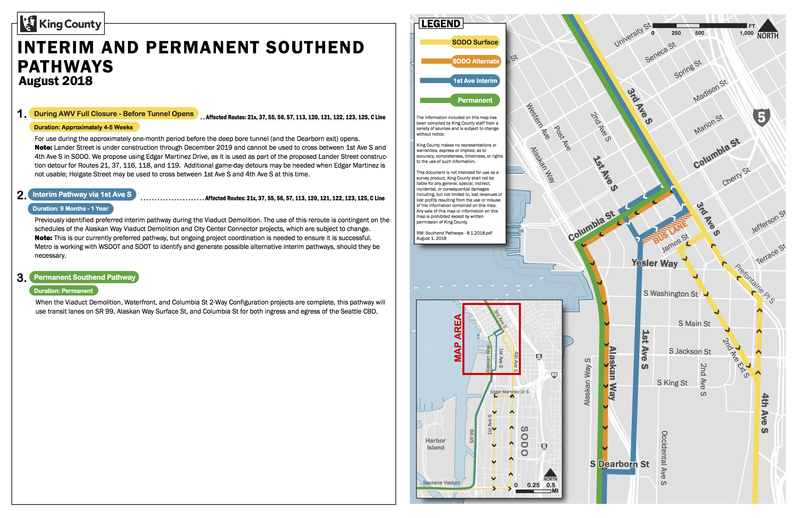 Metro looks like they want RR-C to become an SLU express via the SR 99 tunnel, and they want Route 21 to serve Avalon Link station and terminate in Admiral. I agree that RapidRide redundancy to rail is important! Shutdowns will sometimes happen. Metro Connects has the route on the SODO busway, which ST wants to close in current alternatives. Regardless of station locations, some ability to transfer between the two RspidRide lines at a West Seattle Link station seems to be needed in subsequent versions of the Metro Connects map. When Link shutdowns happen, it will probably keep riders from going to another West Seattle bus at the next station. Metro has repeatedly said that the map is only a series of ideas, not an actual proposal. I really don’t think that Metro will continue to run the RapidRide H to downtown after Link gets there. If they did, then ridership for any Delridge station would be tiny. Who would ride it? Folks trying to backtrack to other West Seattle places? Commuters who think they can outrun the bus via the train? I suppose, but in both cases I think you are talking about a handful of riders. Either way, it makes sense to maximize the connection. Otherwise the station will have tiny ridership, as the potential for walk-up ridership is small, no matter where you put it. There are too many greenways and parks, along with a golf course and a steel mill. It is best to focus on the bus to rail transfers, and hope that people make the transfer, or Metro doesn’t give them a choice. Metro’s new thinking since 2012 or so has been to convert the primary one-seat rides to a trunk-and-feeder system, but to give a one-seat ride on a secondary route that also fulfills other goals. This is a way to compromise with die-hard one-seat riders while still making the route more efficient than just a parallel milk run. In the bad old days, the 7 was frequent on its current route, and the 42 was infrequent on a long parallel route. It was the only way to get from Rainier View to downtown, and if you were on MLK you had the dilemma of walking to a frequent trolleybus or standing still for an infrequent diesel bus. In northeast Seattle, the 70/71/72/73/74 in various evolutions all went parallel to downtown, some as expresses but not very fast (except when they could use the express lanes). In West Seattle, the predecessors of the C, 55, 21, and 120 all had half-hourly service downtown, with the only frequent part where two routes combined daytime (approximately the C to the Junction). In northeast Seattle, the 74 local was truncated around 2000-ish, the 71/72/73 were truncated for Link, and a new one-seat ride was created with the 62. The 62 brought better crosstown service to 65th, and connected it to Fremont and Dexter, and eventually went downtown. Die-hard one-seat riders don’t care about frequency and speed; they just want it to go downtown. The 62 does this while also fulfilling its other goals. In another incarnation, the one-seat rides are diverted to a downtown-adjacent nieghborhood like SLU, Boren Avenue, or the International District. These routes don’t compete with Link directly as much because they stop a mile away from Westlake/University Street Stations, and they address the underserved downtown-adjacent corridors.This has happened mostly in peak expresses and future or cancelled plans, but it’s increasing. In West Seattle, the primary corridor is the Junction to downtown, and the secondary corridor is Delridge to downtown. So Metro plans to replace the C with Link, and keep the 120/H as a one-seat ride. But that may be tentative. Keeping the one-seat ride is probably an early negotiating position, to avoid a freakout now and to determine later how much demand there really is for it. Opposition has repeatedly defeated restructures of the 2, 5, and 12, and Metro doesn’t want to see Metro Connects as a whole go down because of it. So there will be ample time to discuss how much a one-seat H is essential later. One caveat is that the RapidRide line and capital improvements will be done years before Link is, and if the head to downtown is completed it will be difficult to abandon it, and it may be difficult to identify other routes that could use it instead. So we’ll probably get the H to downtown in any case. That will depress Link ridership somewhat (why transfer and wait 10 minutes when you can stay on the bus? ), but remember that Link also goes to other places, and it becomes a bigger advantage to switch to Link as soon as possible for these further destinations. People from Delridge and Burien will go to the U-District and Bellevue and other places, and transferring at Delridge will be better than slogging it to downtown and transferring there. Yes, but most of those places are beyond where the bus is headed anyway. Generally speaking, people stay on the vehicle they are on as long as possible (for various reasons). For example, imagine it is noon and you are trying to get from West Seattle to the UW. You can transfer in Delridge, but it isn’t much faster. In fact, you may be able to transfer in the International District, and catch the other train (the one from Bellevue). If you are headed to Bellevue, you have one fewer transfers (bus to train, instead of bus to train to train). It is only the other stops in West Seattle that have a clear advantage, and for many riders, the best choice is to take a direct bus (e. g. 22, 128, C, all of which cross Delridge). Of course the reverse is true as well. Someone coming from the UW will definitely stay on the train if it is headed to West Seattle. They may decide to change trains in the tunnel, even if the train is headed to the south end. Overall it is a mixed bag, but it still doesn’t add up to many people. In general the West Seattle rail project is not very cost effective. There are only three stops, and none of them are great. Walk up ridership will not be very high and the network improvement for those that arrive by bus will be minimal. For many, the existing buses would be faster. But of all the arguments for the line itself, the strongest is that it allows for significant service savings. Not enough to justify the huge cost, but this is where the greatest value will be added. We won’t need to send so many buses — or any buses — through downtown. It would be a huge waste if we decided to abandon that principle. Ridership would be much lower, while we water down the bus network. It just isn’t a good idea to run half empty trains next to buses when you have a bus network that lacks good frequency. You might stay on the bus. I’m so tired of the annoyance of traffic and stoplights and the possibility of a slowdown that I would switch to the train as soon as I can. The only reason I’d hesitate is if the train station is further from my destination or if the distance was really short. Coming from the U-District to Capitol Hill, I usually take Link but sometimes I take the 49, because the 49 stops closer on both ends, and the total travel time is about the same either way, but on the other hand Link is slightly faster, especially at rush hour, and it’s a train! But when U-District Station opens I’ll take Link a lot more. And even though I generally prefer trains and express buses, I do take the 49 sometimes and used to take the 43, just for the view and the lower stress of local routes, or because I’m not in a hurry or want some time to read. So I take different modes at different times even for the same trip. In case that wasn’t clear, now I take either Link or the 49 from the U-District to the Pike-Pine part of Capitol Hill. Before Link, when I went from the U-District to downtown, I usually took the 71/.72/73X, but sometimes I took the 49 or 43. That is a different dynamic. In the case of the 120, by the time it passes the Delridge Station, there is one stoplight before it gets on the expressway. There aren’t any bus stops until it gets downtown. Sure, there are times when the bus is so bogged down in traffic that the train is faster, but that is rare. Most of the time, it is faster to just stay on the bus. The 120 does not run an exorbitant amount of buses during rush hour (the big buses can handle the load reasonably well). Outside of rush hour, it runs fairly often, and those numbers will increase substantially as it transitions to RapidRide. It really isn’t a commuter bus — it is a full fledged, all day constant use bus (making it a fine choice for RapidRide). So only a relative handful of riders would actually save time by making the transfer. Even a lot of those riders wouldn’t want to. A lot of people just prefer sitting on the bus, even if it means getting to their destination a little later. Just as there are things that can go wrong with a bus, there are things that can go wrong with a train — especially when the train is part of a very long system. Getting from the U-District to Capitol Hill is a different dynamic. You aren’t on a bus that is headed to your destination. You are simply choosing between a one seat ride or a two seat ride. In your case, you are actually following the “first vehicle headed my direction” rule. If you are standing on 15th (where the 49 runs), chances are you will see another bus headed to Husky Stadium before it. You can wait for your one seat ride (that might actually save you time) but most folks hate waiting. It reminds me of a friend of mine who lives close to 25th and 65th in Ravenna. Every weekday morning, he stands on the southwest corner, looking both directions. Cars sometimes think he is trying to cross, but he is simply looking for the 76 or the 372. The 76 will get him to work faster. That is his preferred bus. But more often than not, he ends up catching the 372, and transferring to Link. Your trip from the U-District to Capitol Hill is similar. But again, that is a different dynamic. I’m talking about people who are already settled into their nice warm seat getting up so that they can go up a set of stairs to then wait for a train that runs every ten minutes. Some will, some won’t. I’m just saying that doing that would not only hurt ridership for Link — making frequent midday service on West Seattle Link difficult to justify — but be hard to justify from a system standpoint. Why do folks on Delridge get both an all day frequent express to downtown *and* a train, while folks on Yesler deal with half hour service? It just doesn’t seem like a very good use of resources. But I could see Metro sending the bus somewhere else. Otherwise you are sending lots of buses to Alki (the only logical place within West Seattle to send the buses). Keep in mind, the Delridge stop is for more than just Delridge, it is also for 16th (South Seattle College). So sending a bus to First Hill or South Lake Union could make sense. But even then, I’m not sure if it would really make the most sense from a system standpoint. Saying “only one stoplight to the expressway”. Ignores a whole lot of delays at the other end of that expressway. I ride the 120 daily as a commuter… We always go over the Duwamish with a standing load, and with the viaduct gone there are now no fewer than 10 stoplights between SR99 and 3rd avenue, more in the outbound direction, some of which take multiple cycles to get through. And that’s ignoring all the issues & delay generators on 3rd Ave itself. At the afternoon peak, outbound buses are already way off schedule by the time they hit their first stop on Delridge and bunched by the time they get to Westwood. If you’re trying to use it as a frequent southbound bus with anything resembling consistent headways from white center or beyond, you will be let down. 8 trips per hour departing 3rd and Virginia becomes bunches of 3, arriving a little more than twice an hour at 16th and 107th. Many AM Burien commuters ride nearly the entire length of the northbound route now, exacerbating peak crowding, rather than using frequent express routes from Burien Transit Center, because you simply can’t trust that a southbound 120 will show up in a timely fashion to get you to the transit center in the first place. Make a high quality transfer near Delridge and Andover, cut off the unpredictable, delay prone surface-street downtown leg, and you’ll drastically improve the whole route’s usability and reliability, while probably improving overall rider travel times. with the viaduct gone there are now no fewer than 10 stoplights between SR99 and 3rd avenue, more in the outbound direction, some of which take multiple cycles to get through. Yes, but that is temporary (https://s3.amazonaws.com/stb-wp/wp-content/uploads/2018/09/11110133/downtown.jpg). Eventually the bus will travel on a bus lane on Alaskan Way. I’m not saying that will be perfect, but it will be much better. There will still be times when it is faster to switch to the train, but much of the time it won’t. My guess is, most of the riders — those not commuting — would be better off staying on the bus. There will also be those that would be better off transferring, who prefer staying put. Just as my friend takes the 372, knowing full well that waiting for the 76 would be faster, there will be people who stay on the bus knowing that they would save a couple minutes if they transfer. In any event, I just don’t see that happening. It just doesn’t make sense to send a bus downtown, when lots of people (like you) would rather transfer. You end up splitting ridership between the buses and the trains. Both are lower (between West Seattle and downtown) which is a bad thing. Many would come out ahead if they kept the bus going downtown, but you could say that for buses like the old 73 (that went downtown). We are basically arguing whether people will transfer to the train (you believe they will, I believe they won’t) but either way it is bad for the system. Either you are are sending mostly empty buses to downtown, or West Seattle Link ridership is extremely low (or something in between). That just doesn’t make sense. The speculation from Metro is that the RRH would be repurposed to run through the Waterfront Tunnel and into South Lake Union somewhere. West Seattle residents have long argued for better East-West connections so you could also imagine a possible line running onto the Bridge and going all the way across and up onto Beacon Hill similar to the 50 right now. Delridge, like the stations at NE 145th, and NE 130th, can only be justified as a bus intercept station. Even with a massive overhaul of the zoning regulations in the area, you won’t get that many walk-up riders. It makes sense to make the transfer from the bus to the train as painless as possible. It would be extremely difficult to do that north of Andover. As with the International District, there really isn’t much of a trade-off: the second choice is clearly the best. For the North of Andover alternative, would it make sense to scoot the roadway slightly west, and have the station entrance where the road is today (no need for a mezzanine)? That way, a northbound bus stop can be right next to the station entrance. Up the escalator and you’re at the platform! That is what I was getting at when I said it would be difficult. I can imagine it working, but it would take a lot of effort. There are really two corridors that converge on Delridge (16th and Delridge itself). In their long range plan, Metro suggests sending one bus downtown, and the other to Alki. I would send both of them there, but I am certain that at least one will go to Alki. That means that the bus would have to be in the left lane as it reaches the station (since the right lane is exit only toward the freeway). Now you are adding a northbound bus stop between essentially a freeway ramp and the other lanes. You could add a crosswalk, I suppose, but that means even when traffic is light, it builds up in that right lane (so much so that it would back up right to the bus lane). This would make changing lanes very difficult. So even after spending all that money making the road wide, a bus would still struggle getting from the right lane (where bus lanes are about to added) to the left lane (to continue to Alki). Of course you could add a lane, (as they are doing on 145th for the 522 BRT project) but that is even more money, and would require taking more property. The train itself will take some, so it gets very messy. In general, I just don’t see it. The farther you move it back, the better it is. That is because the freeway backs up in that right lane, and you need to add bus lanes as far as the station. Then a bus changes lanes, and has a smooth ride. Even if traffic backs up far enough to make the lane change tricky, at least that is after the bus has let off the bulk of the passengers. So that means someone headed to Alki in the morning might be a couple minutes lane, but folks headed downtown would be fine. The Delridge bus stops at Andover and Genesee today are very busy and northbound routes frequently leave riders behind at one or both of these stops due to capacity limitations. People are definitely walking up from *somewhere*. You are talking dozens versus thousands. The fact that riders are being left only increases the illusion that huge numbers of people are using that stop (you always see people there because the bus often leaves them stranded). I’m guessing you are traveling during peak periods, when the buses are their fullest (making the numbers seem higher). You would have to stand out there all day and count people to see how many get on, and my guess is you would not get over a hundred. (I sure wish Metro had stop data, then we could just look this up). There just aren’t that many people there. There are some apartments/condos, as well as plenty of duplexes, but there are also a lot of single family houses. But when it comes to future density, that isn’t the problem. The problem is that is that it sits in an area with natural (and unnatural) barriers to population growth. The steel mill isn’t going anywhere (even if it does close, it is zoned industrial)*. The parks aren’t going anywhere either, nor are the green belts. You really have a very small sliver of land which can contain people, which means that the vast majority of the users of that stop will arrive by bus. * Side Note: The steel mill, like a lot of modern manufacturing, is not very labor intensive. Census maps have this as a very low employment density area (similar to Alki). North Delridge stops are always going to be dwarfed by the thousands of bus riders coming through the corridor… This is why I argued to Sound Transit that if the line had to run north of the Bridge along the old monorail route, a station north of the Bridge probably isn’t impacted significantly in its ridership. That said, there are currently lots of commuters who Park & Hide in the neighborhood. Walk-up ridership is not limited to those just living nearby. if ST came to my house in north delridge today and said “we’re going to build a track through your living room.” I’d say “how fast can you build it! ?” we need grade separated rapid transit yesterday. stop quibbling and BUILD IT NOW!!!! i bought this house in 1998 when metro ran the #20. West Seattle has paid its transit dues especially delridge. 20 years of crawling downtown with single driver cars. Just stop the BS already and freakin build it! NOW! How are West Seattle dues any more than any other area. You think it is blazing fast to get from, say, the Central Area to downtown Seattle? Seriously? To get from Garfield High School (23rd and Jefferson) to downtown Seattle takes 15 minutes — in the middle of the day! That is a distance of about a mile and a half. I could probably walk it in a little over a half hour. All the while the bus is “crawling downtown with single driver cars”. In contrast, it takes just about the same amount of time to get from where this stop will be (on Delridge) to downtown. Fifteen minutes. This is a distance of about five miles, or three times that of the Central Area trip. Walking it takes well over an hour. The time savings *for most buses* is huge over walking. Oh, and West Seattle *does* have Bus Lanes. Not the whole way, not nearly as much as they should, but they still have them. The only reason you think the trip is especially time consuming is because you are on a freaking freeway! You assume because we built a very expensive freeway to West Seattle, that transit trips along that freeway (or next to it) should be as fast as they are in the middle of the day. But even when a bus is slogging on the freeway it is faster than the surface streets. Most of the time, a bus on the freeway is blazing fast, several times faster than a typical, urban bus trip. It is really a car centric attitude (one of many). If you think a subway should resemble — and basically mimic — existing roadways, then West Seattle rail sounds like a wonderful idea. If you think subways should resemble successful, very popular subways throughout the world, you don’t. South of Andover does look like a good option. Wish it could be a little more further south, but understand the limitations of turning radius and that we can’t touch the parks. As noted in an earlier comment, the mezzanine could integrate with the pigeon ridge neighborhood by building a pathway up the hill in line with SW Dakota St that could extend to 21st st creating an easy way for the neighborhood to get to the light rail station and Delridge Way. Parcel records indicate the SW Dakota St right of way exists along this route. Probably not discussed enough is the need for upzoning this neighborhood now. There has been a little more increase in density as part of the recently passed MHA near Andover increasing the height limit for the already existing commercial zoning, but little has changed for the low rise zoning that exists. It’s sad to limit the potential of density around a station to a low rise zone. I think the station deserves more than town houses around it. Huh? Not really. The north of Andover station proposal is similar in this regard. Back in the early 2000s I used to work at the office park on the west side between Delridge and the steel mill. I took Metro route 120 in my 2-seat daily commute to work from Wallingford and had a very short walk to/from the bus stops at Delridge and Andover to/from said office park. It wasn’t a great location for my tendency to work long days, given the frequency of the bus during the evening hours back then, but the stop proximity was hard to beat. The area was pretty deserted after 6pm. Thank goodness for Uptown Espresso and the constant activity of trucks going in and out of Nucor. With that said, the south of Andover station proposal seems to make the most sense because of the better bus integration options. Why do we even run Link up to the Junction, seems expensive and dead end. Running Link up Delridge would be much easier and serve more people. We could do a gondola up Fauntleroy and Junction instead.